One of the local historians I really respect said in a lecture many years ago that he believed that the last cross to stand atop San Francisco’s Lone Mountain Cemetery was moved to the park at the top of Mount Davidson. If that was the case, I wanted to hike up to it and take some pictures, since I’m documenting all the relics of the demolished historical cemeteries of San Francisco. It was a gorgeous day yesterday. The sky was flawless and the sun was warm enough to offset the humidity lingering from Saturday’s rain. I didn’t consult a map because I’ve been to the top of Mountain Davidson before, maybe 13 or 14 years ago. My husband parked at one of the stairways into the park and we began to climb. And we climbed and climbed. The fitbit I wear said we climbed 56 flights of stairs before we were done. The park is quite different than the other steep, grassy, treeless hills of San Francisco. Mount Davidson’s paths were muddy and vines choked the trees. Ferns sprouted from the rocks. I’d forgotten how like a rainforest Mount Davidson is. When we finally reached the crest, a plaque said the first Easter sunrise service had been celebrated at the cross in 1923. That would have been before Lone Mountain Cemetery was demolished in 1939. Another plaque said the cross was designed and built by George Kelham and inaugurated by President Franklin Roosevelt in 1934. I wondered if there had been more than one cross up there. 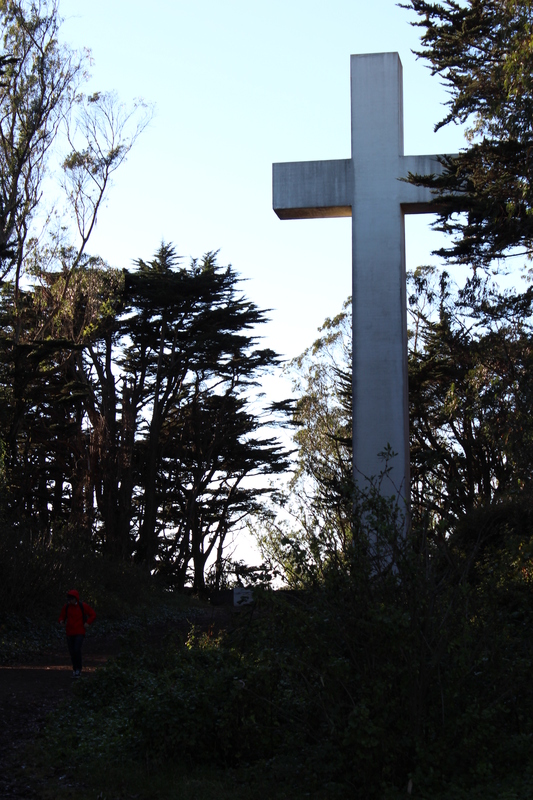 A little bit of poking around the internet reveals that the original Mount Davidson cross was made of wood. It was placed by the congregation of Grace Cathedral, which is Episcopalian. It burned down several times before the cement cross replaced it in 1934. The 103-foot cross was paid for by the Native Sons of the Golden West in memory of the early pioneers. No connection to Lone Mountain Cemetery at all. I remember when San Franciscans voted in 1997 to sell the very top of Mount Davidson so that the city would no longer be responsible for a religious symbol in a public park. With church officially separated from state, the cross and its immediate surroundings were auctioned off. The Council of Armenian American Organizations of Northern California purchased it for $26,000. The cross now stands as a monument to the 1.5 million Armenians killed by the Turks between 1915 and 1923. The California pioneers have been forgotten. Easter morning services are still celebrated at the foot of the cross. The forest of eucalyptus and redwoods have grown up close to it, shadowing it even on a glorious day like yesterday. It might be hard to watch the sun rise from the cross, but the sense of peace, of separation from the city, would be undeniable. I was disappointed that the cross doesn’t fit into my cemetery research, but it was a wonderful day for a walk. This entry was posted in Morbid adventure and tagged Bay Area Cemeteries, Lone Mountain Cemetery, Mount Davidson cross, San Francisco. Bookmark the permalink.